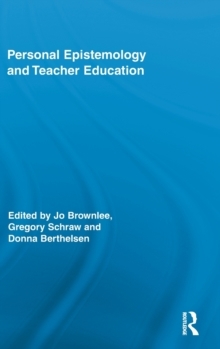 Personal Epistemology and Teacher Education, edited by Joanne Brownlee, Gregg Schraw and Donna Berthelsen, provides an international perspective on teachers' personal epistemology, or beliefs about the nature of knowledge and knowing. Research from The Netherlands, Cyprus, Australia, United States, Canada, Norway, and Taiwan is presented to provide diverse viewpoints on personal epistemology for early childhood, primary, secondary and tertiary teaching contexts. The text provides a platform for cutting-edge theory and research about how personal epistemology can be applied to the context of teacher education, thereby making explicit the connection between personal epistemology and teaching and students' learning outcomes. Topics include:Cultural differences in teacher epistemology and the impact on students' learningTeachers' epistemological beliefs and inclusionTeachers' epistemology and reading lessons, citizenship education, and teaching science Epistemology in a social context Teachers' epistemological beliefs and student autonomyTeacher education and analysis of preservice and practicing teachersImplications of teachers' epistemological beliefsConnections to future practiceTeacher education and teacher behaviours are fore-grounded across the topics, with an emphasis on the origin and composition of teachers' epistemological beliefs and how universities motivate change through formal teacher education. Teaching behaviours are discussed in relation to how teachers' beliefs are related to the curricular and pedagogical choices that they make in their classrooms, assessment of learning outcomes, and classroom management practices.